We are super excited to have Mikah Meyer – Travel Beyond Convention and his partner join us for a Grand Canyon Whitewater 8-day motorized rafting trip in late May 2017! Mikah hopes to “create a new type of LGBT role model” on his journey to be the youngest person to see all 417 national parks and monuments. We caught up with Mikah on the road for a Q and A about his adventures. Q: Tell us a little bit about who you are and your current journey. Hi, GCW! 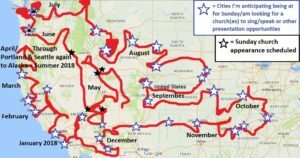 My name is Mikah Meyer and I’m currently 13 months into a 3-year road trip to all 417 U.S. national parks. When I finish at age 33, I’ll be the youngest person to ever experience all the National Park Service sites, and the only person to see them all in one continuous journey. Q: What made you decide to embark on this journey? Why was this important to you? 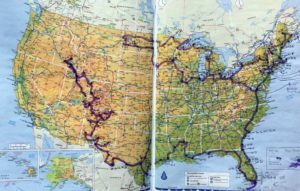 I’ve taken one road trip every year since my father passed away from cancer when I was 19. He was 58 at the time and loved road trips, so it’s been a way for me to connect with him every year, no matter how long it’s been. Over the 11 years of those annual road trips, I really learned the lesson that A) Tomorrow is not guaranteed, and B) It’s a virtue lots of people in their 60s, 70s, and 80s seem to really heed, but everyone else thinks they’ll live forever. So I decided that when I turned 30 I wanted to do something “crazy” and use it to help share this idea with the world, that tomorrow isn’t guaranteed, and we should all follow our dreams sooner rather than later, because we never know what day will be our last. Q: I first heard about your journey in a Washington Post article, where you mentioned that one of the parks you were most looking forward to experiencing was Grand Canyon National Park. You said you would love to do a river trip through Grand Canyon, and that a trip like that would be a sort of “crown jewel” in your journey. Tell us more about that. What made the idea of a Grand Canyon river trip so exciting to you? Totally. (And I’m so glad you read the Post that day!). Contrary to popular Facebook-commenter, I am not a trust-fund kid or independently wealthy, so I’m doing this entire journey on a shoestring and a prayer, scraping by on the money I saved during my 20s. That means that there are no luxuries in my journey. One of those once-in-a-lifetime goals for anyone who loves the outdoors. But it was also a luxury, considering I could technically experience the Grand Canyon by foot. So I was beyond ecstatic when GCW reached out, and gladly arranged my entire 3-year itinerary to allow me to take part in this experience that I expect will only become more of a heralded park experience after I’ve completed it. Q: What has been your experience so far? Have the parks you’ve visited met/exceeded your expectations? Which has been your favorite park experience so far? Well, let me start out by saying that I was very naïve to the National Park Service’s offerings before launching this journey. Like the vast majority of people I meet around the country, I assumed all 400+ sites were akin to the Grand Canyon; not on the same scale, but all based around nature. I had no idea the Park Service managed cultural, historical, and all sorts of non-nature based sites. Now, with the Grand Canyon marking site #176 on my journey, I’m much more attuned to what the NPS offers. Part of that has meant exploring sites that might not be my exact passion, or have been on my radar before this project, but it’s also meant discovering parks that our outdoors cultural canon has largely ignored. For example, Dinosaur National Monument, by virtue of its name/creation, is not one of the 59 National Parks that most people think of when recalling the National Park Service. However, its name is largely a political distinction, and its natural wonders (canyons, mountains, rivers, and more) are far more spectacular than over a dozen of the 59 National Parks I’ve visited so far. So mostly this experience has made me throw names to the wind when experiencing a “national park” (how you’ll hear park rangers refer to most NPS sites, regardless of their distinction as a Monument, Seashore, Lakeshore, Historical Park, etc.). 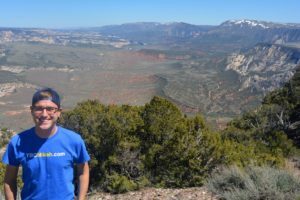 Because of that, I’ve been rating my experience at each park as a 1 – 10, so once I finish this journey, I can make available to all park visitors a guide that goes beyond the names, and shares the best visitor experiences across our National Park System. Q: What are you most looking forward to on your Grand Canyon river trip? Not being accessible to my email or cell phone for 8 days! It’s hard to see from my social media pages or blog, but for this project, I spend more time in libraries and on my computer/phone than I do in the parks. From being my own planner, photo editor, videographer, publicist, secretary, fundraiser, agent, and tour manager, the amount of logistics it’s taken to fund this project while completing it has made me cringe at the sound of my email alert. So for probably the first time in my 13 months on the road, I’m looking forward to being able to just experience the park; not having to worry about spending my nights bumming Wi-Fi from the front seat of my van in place of star gazing. Q: What advice to you have for young people? What’s a lesson you’ve learned on this journey that you’d like to share with others? Don’t put off your dreams. Whether visiting the parks or any manner of things with their life, nobody seems to lament the things they did do, only that which they didn’t attempt. So take risks, young people (and all people). We only have one life, and we don’t know how long that life will last. Whatever your goals or dreams, figure out what you can do today to start making them happen. Even if you don’t think you have the time, talent, or finances, start the process. I began this journey without the money to finish it (according to national park experts), but here I am, 13 months later, still on the road. Where there’s a will, there’s a way. So whatever your goal, throw yourself into it, even if the world says it’s crazy. If the people I’ve met along the way are any indication, when you’re older, you’ll be glad you did. Map of my completed journey, 13 months into my project and two weeks before reaching the Grand Canyon. Q: Talk a little bit about the diversity, or lack thereof, you’ve encountered on your journey, and why you think it’s important our national resources are accessible to folks from all walks of life. How can custodians of our national parks (like GCW and the NPS) help make these resources more accessible to diverse groups? It’s a very constant refrain from outdoor organizations that we need to do a better job of making nature accessible to people of all stripes. Much of this is tied into larger socio-economic issues that go beyond just efforts of outdoors organizations (like how so many natural sites require a car to visit, and if you can’t afford a car it doesn’t matter your interest), but a lot of it also has to do with visibility. 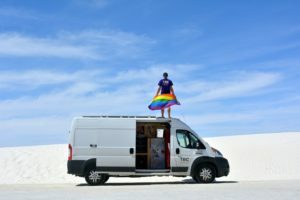 The outdoors industry is incredibly white and heteronormative in its advertisements, stories, and sponsored public figures, meaning people of color and non-straight people often don’t feel safe in these spaces. Even, as many people like to point out, “the outdoors are open to everyone,” it can be very hard to feel welcome or secure in places where you don’t see anyone who looks like you, and can keep someone from even giving the outdoors a chance. As Marian Wright Edelman, founder of the Children’s Defense Fund, says, “It’s hard to be what you can’t see.” So for the people who see, for example, a recent outdoors magazine that featured a 12-page spread on How To Find Your Ideal Date Who Loves the Outdoors and used 12 photos that included only white, heterosexual couples, it can be hard to feel welcome and wanted in the outdoor community. While I think, institutionally, public outdoor spaces should partner with corporations to fund accessible transportation that is symbiotically beneficial (for example, a “PetSmart Bus” that runs from downtown Phoenix to Flagstaff every Saturday and is free to anyone on the free/reduced lunch plan or under a certain income level), there is also a lot we can do as individuals to be custodians of the parks. Those of us who feel safe or materially prepared to visit the outdoors can reach out to those who might not feel welcome or equipped and invite them to join us. If we each brought one person who might feel unwanted, we could create ripple effects that will exponentially reach diverse groups. Q: What has surprised you most on this journey? What has been the most challenging aspect of this trip? How would you do things differently? I would become famous first. So I would’ve gotten a TLC show, had a hit movie, or started a Twitter war with someone famous. All jokes aside, I definitely would’ve spent more time building my van home “Vanny McVanface.” I spent the two years leading up to my project’s launch pitching every automobile/RV/travel-trailer company in hopes they would want their vehicle seen in every corner of America. Two months before that launch day, I realized it was not going to happen and I needed to build a mobile home: fast. That may look different in the way we express the desire, or the way we want the world around us to express it, but deep down, every single person is looking to be fulfilled in those ways, and that makes us all one giant group of people in pursuit of the same happiness. Q: Where are you headed next? Initially, the goal of my journey was to hearken back to the glory days of Westphalia and free roaming schedules that turned on the direction of the wind. But I very quickly learned that nearly every logistical aspect of my trip would be eased by the amount of time I could plan in advance. So as of today, I have my next 18 months planned. 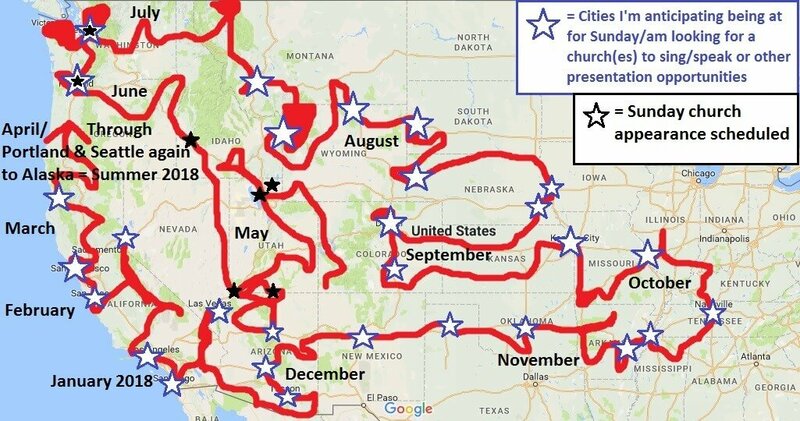 That loosely looks like this summer in the Pacific Northwest, fall in the Rocky Mountains and southern Midwest, winter in the deep Southwest, and next spring on the West Coast before heading to Alaska for summer 2018. Specifically, below is a map of my expectations through August 2018, including cities where I expect to be singing/speaking at public events so people all over the country can meet me and ask questions about my project.